WitchHunter Performance uses specialized equipment for fuel injector testing. The ASNU is pretty much the standard for injector servicing. They can test and flow up to eight injectors at once for accurate comparisons. But as purchased, we found that they needed improvements. Pretty good just wasn't good enough. We modify all our machines, these modifications depend on what injectors we we plan to test with that particular machine. Improved injector drive circuitry, to mimic actual conditions. Variable injector drive voltage for specialized customer requirements. 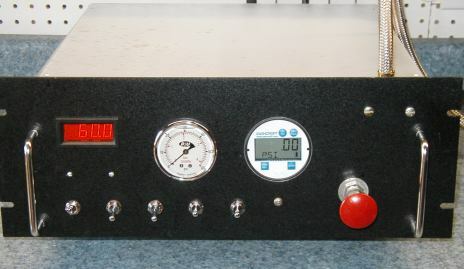 Variable pump voltage, for testing at a wider range of pressures. 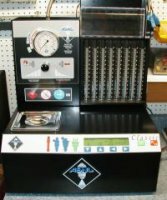 All of our test machines have accurate digital pressure gauges installed to give better consistency to our flow readings. Each of these are calibrated to 0.25%. 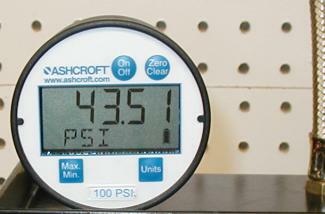 We also retained the dial type gauge to watch for fluctuations or any other abnormalities. This is a magnetically coupled, stainless steel pump that can deliver over twice the flow as the stock ASNU pump are on all our test machines They do a better job for the larger injectors. We invest heavily in injector test adapters, this allows us to service most all types of top and side feed gas injectors. What we can't buy, we will get custom made. You can't get good results without the right tools for the job. 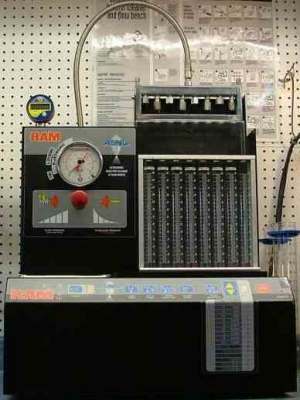 We only use a certified test fluid to get good flow results. Each batch has the analysis results on the label. 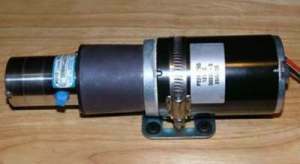 This fluid is very stable and will not harm the internal seals of the injector. We don't use Heptane, like most of other shops because it will give higher than gasoline flow results. This is our 3rd version, and was just put online in October 2012. it circulates the test fluid continuously from the test machines. The fluid is double filtered down to 2 microns, then heated or cooled as needed. 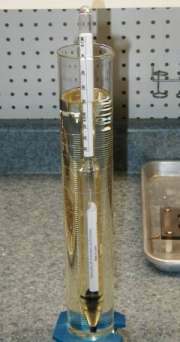 We can keep the test fluid temperature stable within 1 degree F. This allows our measurements to be repeatable. One of the advantages of having an owner that has worked as an electronic design engineer for over 20 years. No other injector shop has anything like this, (to our knowledge). 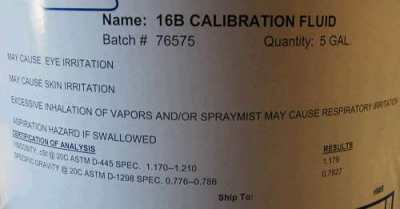 We perform this test twice a week to verify the condition of the calibration fluid. When it falls out of spec, we change it. Designed specifically for large injectors flowing up to 2000 cc/min range.